The challenge of the panel jump is that the dog has to clear what looks a solid wall to him. 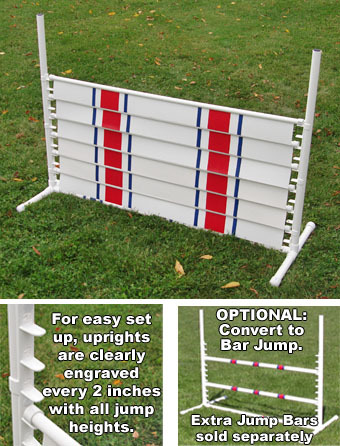 The panel jump is also an agility obstacle that is used in obedience trials (as is the broad jump). The "wall" is made of 6 individual panels that rest on 12 pairs of jump cups. This jump conforms entirely to AKC/USDAA standards. The side bars are 37 1/2" tall, and the panels are 48" wide. By removing or adding them, the height is adjustable in 2" increments, from as low as 4" to as high as 26". The jump cups are permanently fixed to the side bars and the heights are clearly engraved for easy changes. The other nice feature of this jump is the fixed bottom bar along the ground. This keeps the jump stabilized and evenly spaced so it can just be picked up and moved as needed, even with the panels still on. The pipe is made of furniture-grade uv resistant pipe with a 1 1/4" OD and vinyl panels. All weather construction - never needs painting. Includes free tape for decorating. One of the best prices for a Panel Jump you'll find anywhere! Optional: Buy an extra bar (or two) to convert your Panel Jump to a Bar Jump. (You would need two bars to make it look like the picture at the bottom right). No extra shipping for the bars. To Order, Choose Quantity & Click the Add to Cart Button! Optional: Plain Jump Bar ... $10.95 ea.